Franklin J. Flocks acts fast and stops action to show us what we missed. 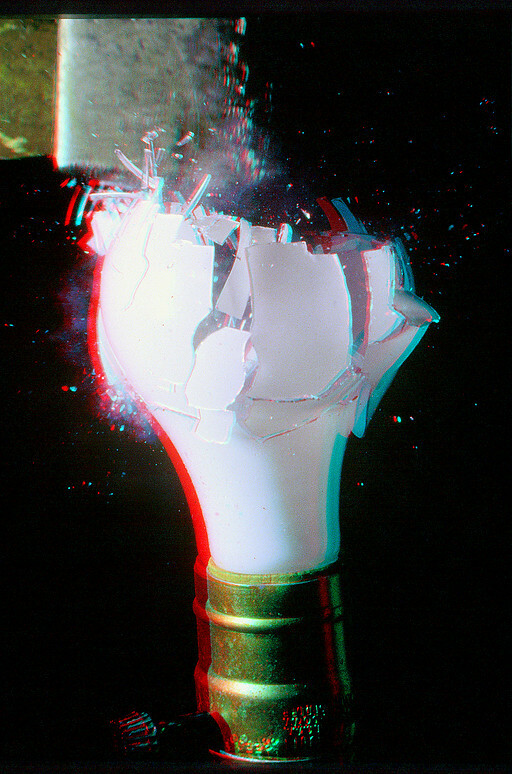 Blink your eye, that is about 1/68th of a second. Well, a lot happens in that time period so blink faster. But of course you can’t blink any faster than that. However, cameras and flash units can blink a lot faster and they can capture what they see in that time period which shows us images we wouldn’t have been able to appreciate otherwise. High speed photography is all about freezing unseen moments in time. 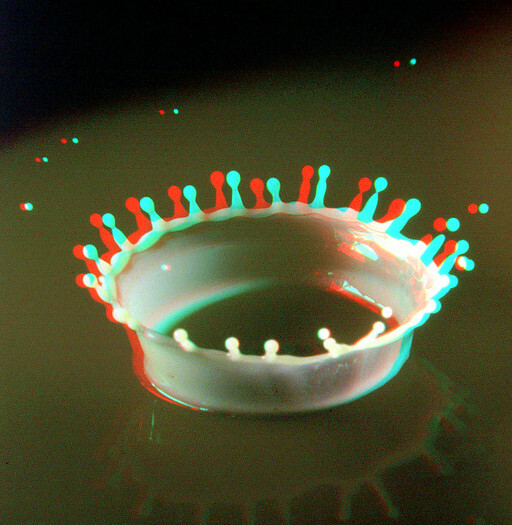 When done in 3D stereo it is very impressive. Part of the challenge is being able to time when to shoot. Special sound or motion triggers are often used with still cameras to sense the best time to take the shot since the human vision and reaction time is not that fast. 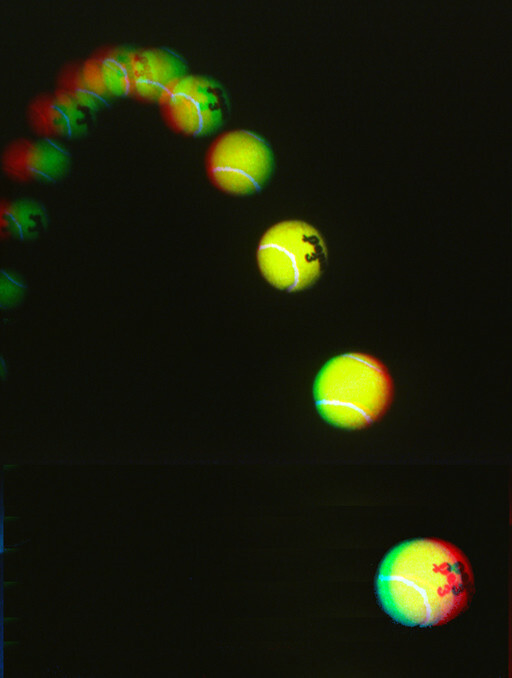 Franklin used sound to capture his high speed images (sound is really, really fast). Since the flash is faster than the camera’s shutter he worked in the dark with the camera shutter open and used a sound trigger to set off the flash to capture the image. With modern digital cameras that shoot as fast as 300 frames per second we also have the option of shooting high speed video and picking out the most compelling frames. 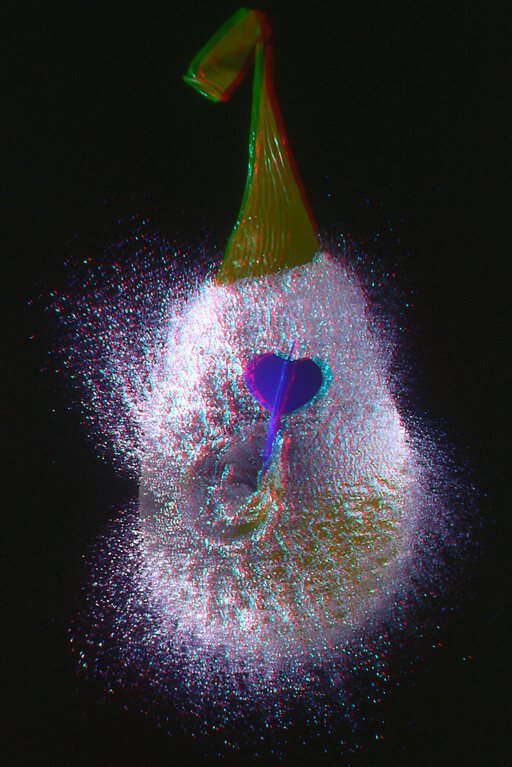 Slow down and spend some time to appreciate the high speed 3D images below courtesy of Franklin. Franklin is active on Flickr and you can see more of his photos there. I am lawyer practicing in California and 3D is purely a hobby – However, I have a special interest in high speed 3D. 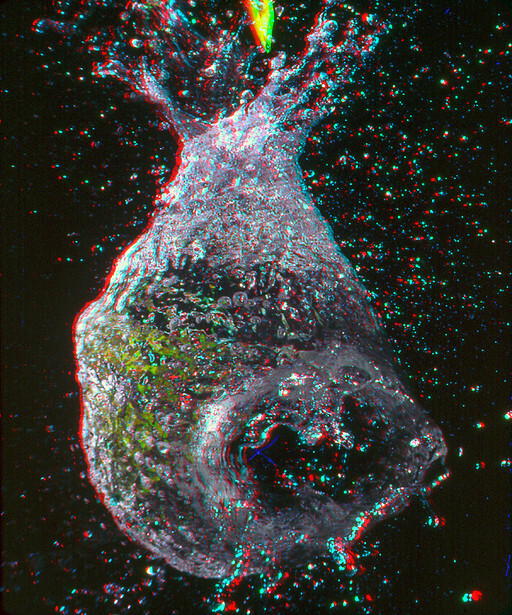 High speed photography is inherently surreal – in the sense of being disorienting or dreamlike. Since we can’t see fast moving things – without cameras and strobe flashes, it is difficult to judge sizes and shapes, in high speed photos. It occurred to me that 3D photography would make it possible and in 1993, I was fortunate to be able to borrow two macro 3D cameras built by the English stereo expert, David Burder. All of my high speed photos were taken in the dark with the shutter open – using a sound trigger to trigger the flash. I have known Franklin for a long time and really enjoy his high speed stereo images. You really get to see things that the human eye was never meant to see. The technique of high speed photography is very cool in 2D, and I’m so pleased that Franklin has paved a path to the 3rd dimension for this area of photography. Great work! 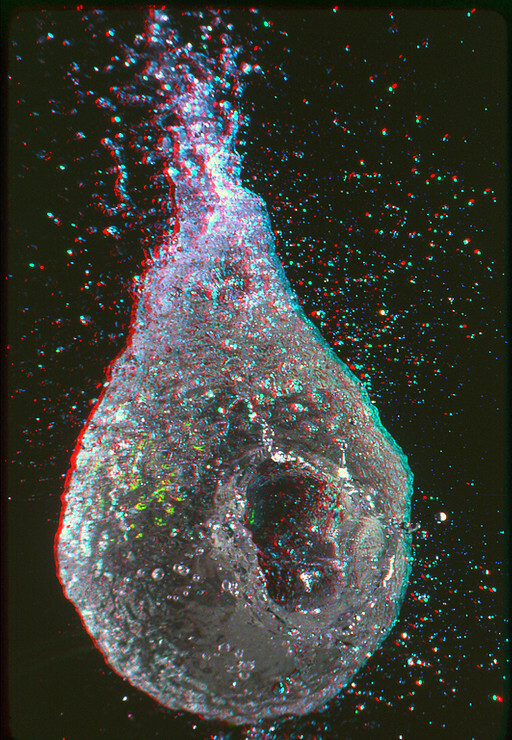 I keep coming back to the exploding water “bombs” which are so fascinating in stereo. Here I am again!